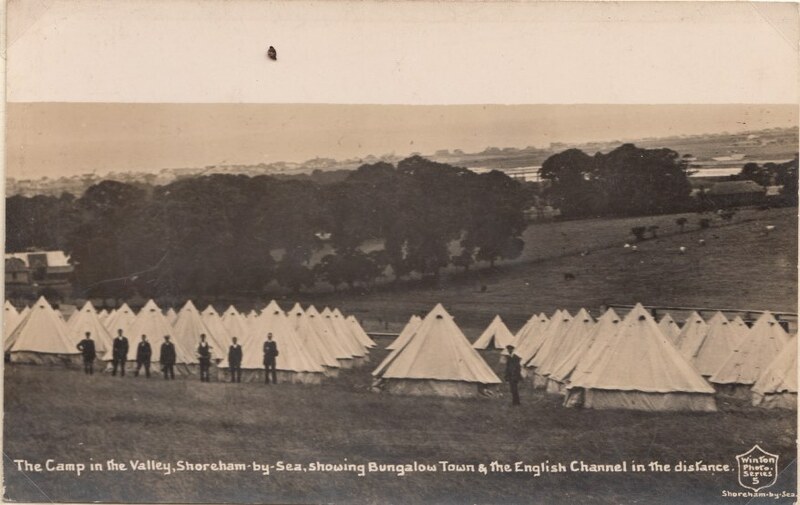 On This Day 1914: Thousands of tents spring up on Shoreham’s Downs. One hundred years ago, when Napoleon was threatening these shores, the coasts of Sussex became an armed camp. Today history is repeating itself. Thousands of tents have appeared on the slopes behind Shoreham housing a ‘motley crew’ of volunteers for Kitchener’s Army. They are training there under Divisional Commander Major General Sir J. G. Ramsay, K. C.B. Image Courtesy of Graham Booth. This ‘hatless brigade’, with no uniform and little equipment, have come from the four corners of England with one determination in common – to make themselves efficient in the quickest possible time. Squad drill and Swedish exercises keep them ‘as fit as fiddles’. They wash their own clothes in cold water and many have named their tents with wonderful titles such as, ‘Haunted Castle’, ‘Dreadnoughts’ and ‘Humming Birds’.